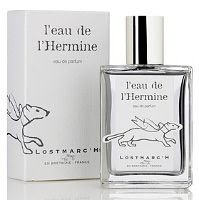 Those who, like me, shy away from full-on lavender scents, because of their sharpness, and those who, like me, are bored with citrus scents, because of their ubiquitousness, should, like me, find in L'Eau de L'Hermine a wonderfully wearable, soft lavender and an interesting take on citrus. I like it so much, I want to swim in it. Floral sweetness of neroli and peony brings out a honeyed, fruity aspect in lavender. Gentle fluffiness of heliotrope softens the jagged edges of the note and tones down the prickly, nose-tingling freshness of grapefruit and bergamot. There is a certain sweet cleanness or clean sweetness about L'Eau de L'Hermine that I find very appealing. A certain effortless simplicity, which is in fact a sign of harmonious complexity. This is summer in a bottle... the breeze carries the freshness of the sea, the herbal and honeyed aroma of lavender, the candied fragrance of orange blossom...It's a story of how, in the sun, in the face of the endless sea, things come into perspective, entanglements get disentangled and dilemmas come to a natural resolve, all on their own. A Summer Tale. "One winter day our queen Anne de Bretagne was hunting the Hermine for its white fur, in front of a dirty pond, the Hermine stoped. Anne was so impressed by the animal's behavior, that she decided it could not be hunted anymore, and became the symbol of all the Breton: "rather dead than dirty", in France (as she married the king) later on the Hermine became the symbol of justice and purity." Available at Beautyhabit and Lostmarch, $85.00 and €55.00 respectively, for 100ml. This reads so great: I feel so out of it I didn't know. When is it stateside? Sounds great! Their Din Dan is summer in a bottle for me, so I'd love to try another Lostmarc'h take on citrus (although lavender is usually a dealbreaker). I love that bottle! This definitely sounds like a happy beach scent. Must try! And thanks for the review, because, given the notes, I seriously doubt I'd have given this a second thought otherwise. I should re-try Din Dan then, I can't remember it, for some reason. I wouldn't have thought I'd like it either, given the notes. This is all I want to wear right now. You need to hire yourself out, Marina...I do not like citrus and lavender is at best so-so for me, but I am now going to have to at least sample this. And I am not a bottle junkie by any means, but this one is too precious along with the story behind its' name. Thanks for another great review! The bottle does look very appealing. I like the whiteness of it. A perfect sigh of a scent for summer, I would love to try this. Normally I like my lavender solo, but with peony and the other lovelies in this stuff, it sounds like it really works! "...things come into perspective, entanglements get disentangled and dilemmas come to a natural resolve, all on their own. A Summer Tale." I know what you mean, but I always thought Autumn would be more appropriate. There's something so sad about September- the end of summer and only the prospect of cold and gray months. It really works. It's a gentle lavender though.